Embark on a more sustainable adventure in Norway. Meet seven people that live their dream and invite you to join them on everything from glacier hiking to whale safari, or to stay in their cosy mountain lodges with soft beds and local food. For the next five hours, we will be walking a slippery slope. 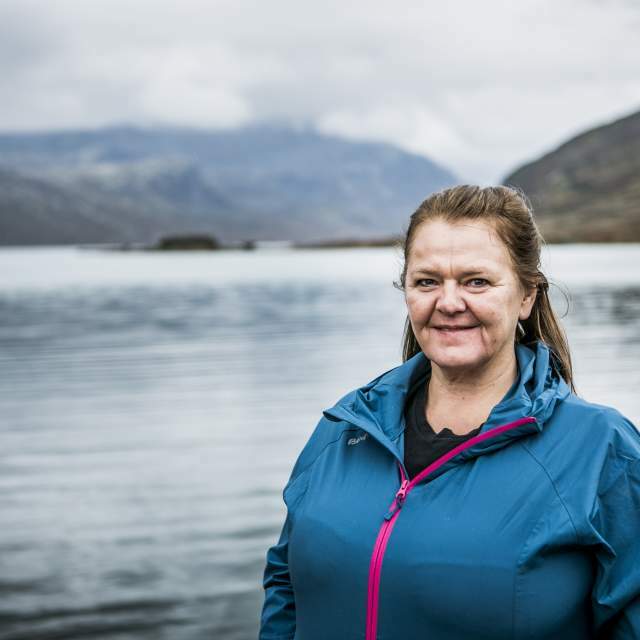 Linn Larsson, certified glacier guide at Jostedalen Breførarlag, is about to hand out gear for a much-awaited hike on nature’s own giant ice cubes. Our eager group consists of twelve people from China, The United States, France, Italy, and Norway. Linn’s prime task will be to lead us safely up the steep instep of the glacier and then back down again five hours later. Our ice axes make us look tough, and we can’t help feeling proud. “Make sure to hold your axe down with the pointed part backwards. Never lay it on the ice, as the slippery surface may cause the axe to slide away”, Linn instructs us in a calm, but firm voice. Then there are the crampons, a sort of armoury-like iron sandals with spikes pointing downwards to ensure a solid grip. Step by step Linn shows us how to wrap them extremely tight around our newly purchased hiking boots. A long solid safety rope ties our group together, fastened to outfits that look like a curious mix of leather belts and underwear. Linn and a colleague carefully check that everyone wears warm, windproof clothes, before she patiently answers our numerous questions as we slowly begin the walk up the glacier front. 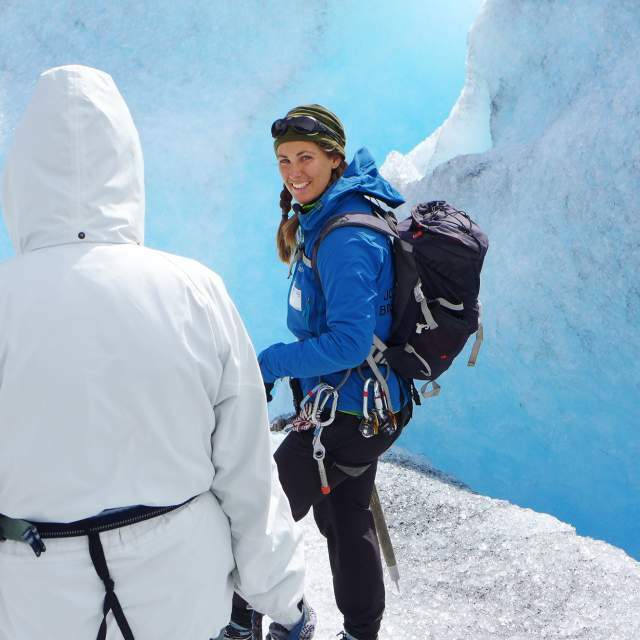 The 27-year-old has three years experience with glacier hiking. Every morning the guiding company sends up to ten professionals to test the routes on the ice before they start the tours. “Remember, this is powerful material: One cubic metre of ice weighs one tonne”, Linn says. The main glacier Jostedalsbreen is 600 meters at its thickest. Its most famous glacier arm Nigardsbreen moves downwards towards the valley with about one metre every day. It shrinks about 30 meters in total during a normal year. “Concentration, please!” Linn yells. We carefully lift our mountain boots over narrow crevices that run ten metres or more into the ice. After half an hour, we finally take a break on the glacier plateau. “Ready for a photo session?” Linn grabs our cameras and smartphones one by one to help us capture the moment. As soon as we’re back on firm ground again, loads of icy photos are posted on social media for Chinese, Russians, Americans and the rest of the world to admire. It’s time to return the ice axe to Linn, though we would have liked to keep it. In retrospect, our glacier hike seems a bit demanding (as it should), but also rather uncomplicated. In the area around the glaciers Nigardsbreen and Jostedalsbreen, you can join several glacier walks that are both less and more demanding and time-consuming than ours. Read more about Norwegian glaciers. As a hiker in Norwegian nature, you will find more than 20,000 kilometres of marked trails. You know that you are on the right path when you keep passing cairns, rock walls, trees and poles marked with hand-painted Ts. This important letter is the widely known symbol of The Norwegian Trekking Association (DNT), the country’s largest outdoor activities organisation. The useful T signs are regularly maintained and repainted by voluntary members like Jorid Rajala so that you can keep on hiking safely and find your way back to your base before it gets too dark. Read more about hiking in Norway. 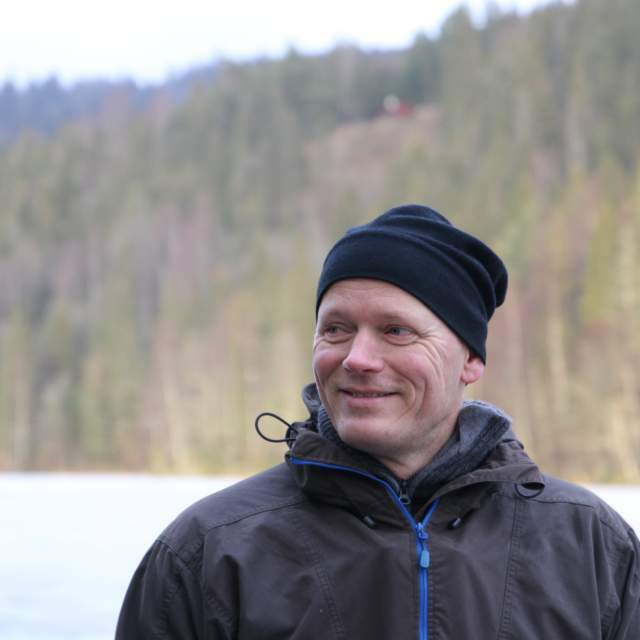 “Sustainability is our nerve”, says Marius Haugaløkken. 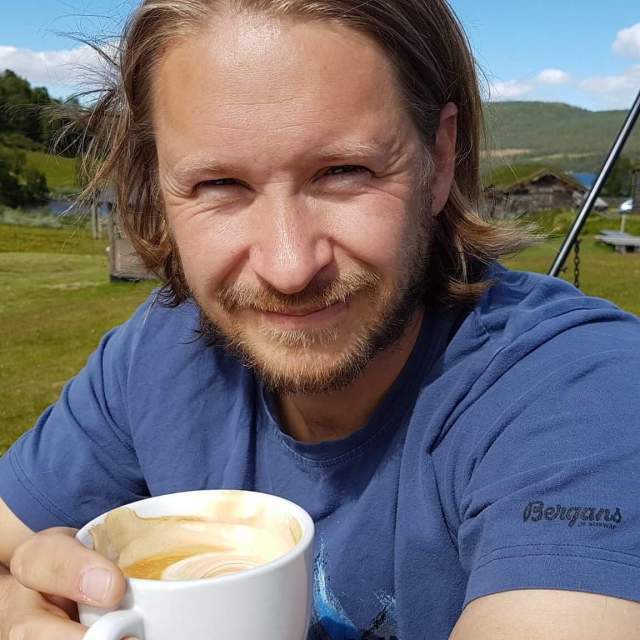 Since 2011 he has run the staffed lodge Gjendesheim, which is situated at the natural entrance to the eastern part of the Jotunheimen mountains, very close to the famous Besseggen hike. Gjendesheim, which celebrated its 140th anniversary in 2018, is The Norwegian Trekking Association’s most frequently visited lodge. Gjendesheim also cooperates with other lodges in the area on ​​a so-called Besseggen patrol project, where a qualified person helps hikers in the mountains to return safely at the end of the day. “Our goal has been successful in avoiding dangerous situations where tourists get too cold or are unsure about the path”, Haugaløkken explains. It is easy to get to Gjendesheim by public transport, with daily bus connections from Oslo, Fagernes, Gol, and Otta during the summer season. “Trasti & Trine is our dog sledging company, which emphasise educational experiences and joy through the sense of achievement and deep respect for animals and nature. For a start, we encourage our guests to be active in the preparation of dogs and sledges. Our long experience helps us understand the individual skills of our guests”, says Trine. After an adventurous ride with eager dogs in the snow-covered forests around the northern city of Alta, Trine and her team also serve local, award-winning, organic food. “Whether it’s breakfast, lunch in the mountains or seven dishes in the restaurant, we know each ingredient’s origins”, Trine says enthusiastically. As a bonus, their summer cafe and bakery have become meeting places for the local community in the small town. “All this is very important to us”, adds Trine, whose company is certificated by Norwegian Ecotourism. Read more about dog sledging in Norway. Yes, Norwegians pride in local food goes all the way into the mountains. Solbjørg Kvålshaugen has run the place Fondsbu in the southern part of the Jotunheimen mountains for more than ten years. Fondsbu has always been known for its passion for fresh ingredients. Typical highlights of their three- or four-course meals are lamb, veal and reindeer from local producers, and trout from the nearby lake Bygdin. “Here at Fondsbu we prepare our own food with love and respect for our guests”, promises Kvålshaugen, who has given us glimpses of the busy country life at Fondsbu through the popular Norwegian TV documentary series “Mountain people”. Fondsbu serves as a great base for a lot of popular hikes. It is very easy to get here during the summer season, with daily buses from Oslo, Årdal, Bergen, and Lillehammer. You can also cross the more than 20 kilometre long mountain lake Bygdin in a small cute boat that corresponds with buses from Fagernes and Gjendesheim. Read more about the Jotunheimen mountains. "Our aim is to become the first alpine resort with a CO2 neutral operation”, Mads Mørch, the snow manager at the Oslo Winter Park, says. New snow cannons are supposed to be more energy effective than the ones they have replaced. "Finally, we never stop encouraging our steadily increasing number of skiers, as well as our employees, to use public transport. All in all, we are certified as an Eco-Lighthouse”, Mads informs us, before he plunges down the hill on his own freshly prepared snow surface. The Winter Park is just a short metro ride from the very centre of Oslo. So remember to pack your skis on your next city break! Read more about alpine skiing in Norway. 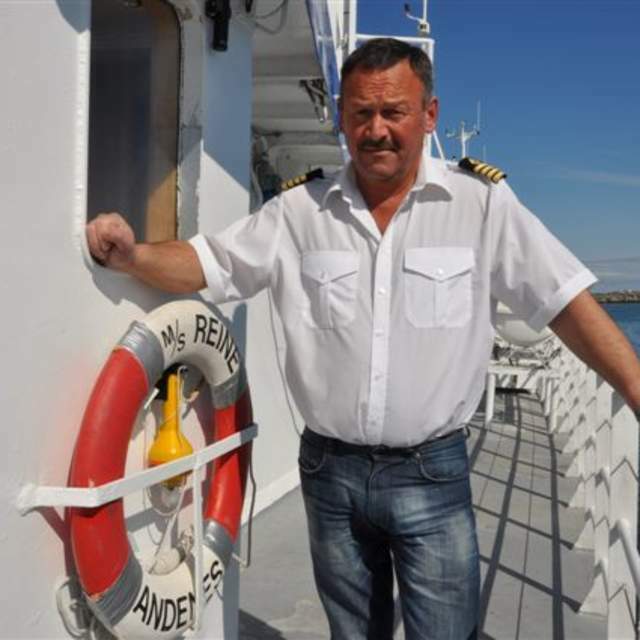 “My crew and I use all of our experience to approach the whales without disturbing them in their natural environment”, says Geir Maan, captain of one of the ships that take the largest number of curious travellers on Norway’s ever-popular all-year-round whale safaris. And what a sight! These kings and queens of the ocean weigh up to nearly 60 tonnes. For a start, whale safari companies in Norway work according to guidelines created by The International Whaling Commission and The Whale and Dolphin Conservation Society. Moreover, most companies have their own strict locally adapted methods to respect the animals and the environment. “For Whale Safari Andenes, it means measures like ongoing work to reduce noise and pollution, and keeping a respectful distance to the whales no matter the situation”, says Captain Maan, before he heads out towards the open ocean with a new group of excited passengers in the wild and beautiful islands of Vesterålen, Northern Norway. Read more about wildlife safaris in Norway.